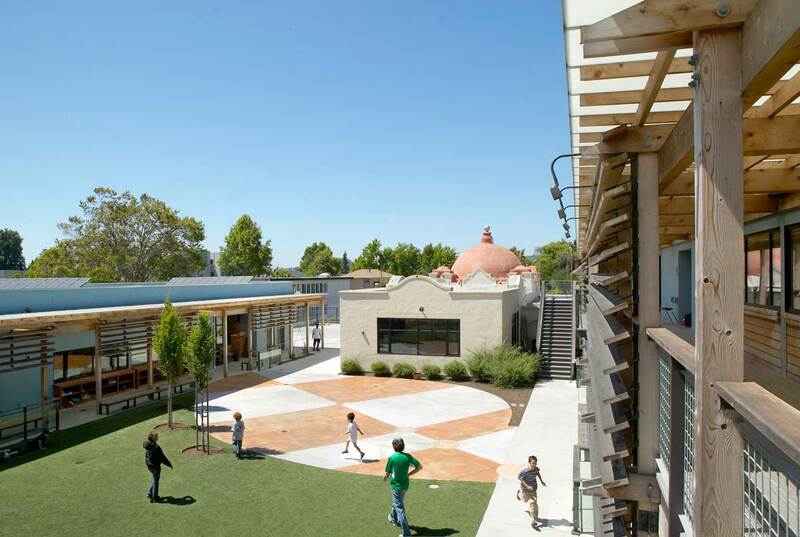 As a result of a winning competition entry, the master plan and design for a former historic Santa Fe Railroad Depot site achieves the best balance between the urban site context, the pedagogical needs of a Montessori teaching environment, and a strong attention to sustainable building. The overall plan is thoughtful and flexible, addressing budgetary constraints with the need to create a stimulating, flexible and playful setting for the students. Careful siting, massing, program organization and use of materials combine to create an exciting new home for the Berkeley Montessori community that celebrates the history of the Santa Fe building as the centerpiece of the new campus and provides the best possible environment for children to learn via the Montessori teaching experience. The building massing creates a courtyard that is open to the south for maximum daylight and visual connection to the adjacent community park. This massing also creates a sense of community and a connected environment for the children with trellis elements defining the circulation patterns. The trellises incorporate seating and gathering areas, vertical garden elements, and places for animals, snakes and birds. The building program is organized to provide flexible phasing which accommodates all of the required program at initial use, yet still allows for future expansion. Key elements of the plan include a U-shaped courtyard with an open connection to the park; elementary classrooms with direct access at-grade; middle school classrooms with access to a balcony; and an after school space connected to an outdoor playground. The scheme places a strong emphasis on sustainable design strategies, including, solar hot water and radiant in-floor heating, optimum orientation for natural lighting and ventilation, use of sustainably-harvested building materials and possible on-site power generation.